This adventurous trip around Peru takes us to fascinating sights beyond the classic highlights. We travel up to the archaeological paradise in the north, exploring the pre-Inca ruins near the desert of Chiclayo, before traversing the Andes to the ancient city of Kuelap, the 'Land of the Cloud People'. After relaxing in our jungle lodge at Tarapoto, we journey to the south, where we marvel at the ancient Inca site of Machu Picchu, explore the Sacred Valley and admire the sunset over Lake Titicaca, staying overnight with an indigenous family on one of the lake's islands. Titicaca Train - £280 Subject to availability - this must be pre-paid at time of booking and is non refundable. If you change your passport between your time of booking and prior to travel please take your original passport with you to avoid being fined. The highlands enjoy dry sunny days but extremely cold nights so thermal underwear, a well-insulated fleece/jacket and a thick jumper are essential. Bring something warm to sleep in. A light raincoat is recommended, as well as walking boots or shoes if you wish to do the optional jungle hike to Gocta Falls. A sun hat and sunglasses are advisable as is high factor sunscreen, due to the thinness of the atmosphere. Bring a swimming costume. Comfortable shoes and lightweight walking shoes and sandals. If participating in the rafting, old trainers or river shoes (as they will get wet). One main piece and a daypack and an extra bag for the overnight in Aguas Calientes - The main bags will be left in storage in your hotel in the Sacred Valley. Remember, you are expected to carry your own luggage (i.e. on and off transport etc.) so don't overload yourself. It is recommended you bring lockable bags. Binoculars, torch, water bottle, insect repellent, high factor suncream, good quality sunglasses and a lipsalve with sun protection. Mosquito nets may not be available, so you may wish to bring your own, and for your time in Tarapoto we recommend long sleeved shirts and full length trousers to avoid insect bites. You will also want to take a small backpack for walks and day trips. Accordingly, you should allow at least US$ 40 for tipping. Peru: Visas are not required for UK, New Zealand, Australian, US and Canadian citizens. Other nationalities should consult the relevant consulate. You should confirm all visa related issues with the relevant Embassy prior to departure. As this tour reaches altitudes of over 3800 meters, we strongly recommend that travellers with heart or lung conditions, anaemia, asthma, high blood pressure or on the pill should seek the advice of their GP. This itinerary is a comprehensive journey through Peru's many wonderful sights, from Andes to rainforest to desert, including the ancient ruins that most travellers don't make the time to see. 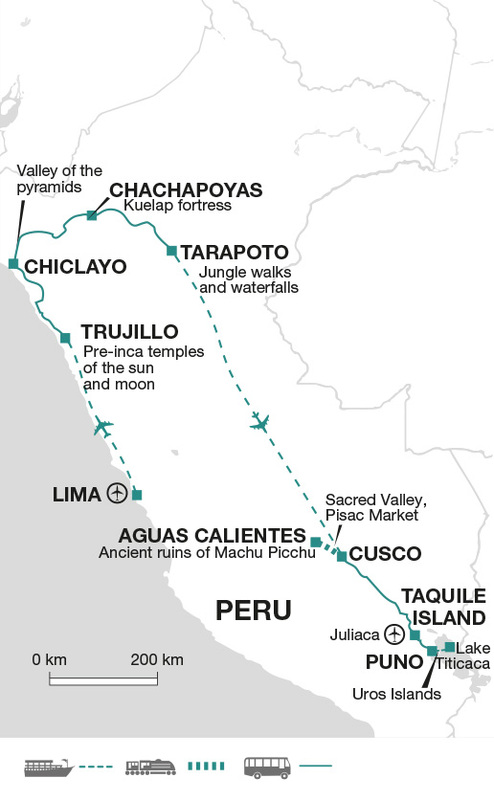 For three weeks in Peru, this is the best itinerary possible.